This month, Intertops Casino players will be competing with each other for a spellbinding $120,000 in prizes during the bewitching Money Magic bonus contest. $30,000 in Money Magic prizes will be awarded every week until December 3rd. Also, An enchanting new Asian-themed slot game called Plentiful Treasure makes its debut this week. 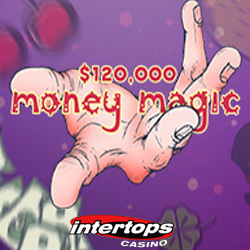 This month, Intertops Casino players will be competing with each other for a spellbinding $120,000 in prizes during the bewitching Money Magic bonus contest. $30,000 in Money Magic prizes will be awarded every week until December 3rd.